The following is taken direct from the press release Moto Guzzi made available about the California Vintage and the Norge 1200 at the Milan Show on November 15. An Italian custom bike for the US police. Thirty-five years have gone by, but the Moto Guzzi California continues to play a leading role in the collective imagination of motorcyclists throughout the world. In 1971 when the first model was introduced, the custom market was divided into the original US models and their imitations from the East. Moto Guzzi introduced a motorcycle with a strong personality based on the tried and tested frame of the V7 Special and the legendary 90° V-Twin engine with a capacity of 757cc. A winning combination which won international success, not least because it proposed a new way of motorcycling, in contrast to the exaggerated quest for performance. On a Guzzi California, you travelled - and you travel - in total relaxation. The seat, as comfortable as an armchair, enables you to enjoy the landscape protected from the wind in the shelter of the large windshield, fitted as standard together with the panniers, a clear sign of its vocation for travel. These qualities enabled the V7 California to triumphantly cross the ocean where it was adopted first by the L.A.P.D. (Los Angeles Police Department) and subsequently by other US states. The rest is history - and legend. A familiar presence in films and advertisements, the California has every right to be considered as one of those industrial design objects which have left their mark on our history. Its two legendary wheels have never stopped - and neither has its evolution. Year after year, the look and technology has been updated, without altering its original personality and spirit. Now, 35 years after its birth, Moto Guzzi has decided to pay tribute to this extraordinary model by creating an exclusive Vintage version, dedicated to those who want to go on dreaming. The discreet charm of tradition. Technology and tradition have inspired the numerous changes defining the character of the California Vintage, a cult object even before its market launch. The reference to the past is obvious in the delightful spoked wheels, in the newly-designed steel mudguards, in the new Brembo front callipers with black finish and in the supplementary fog lights, controlled by a switch on the right block. In this model, attention is paid to the smallest detail - the windshield is decorated with a stainless steel strip and both the handlebar and two-tone seat are exclusive to the model. The classic engine is protected by chromed steel tubes with integrated. The special bags are fixed, made from rotational nylon, waterproof, lined and again protected with chromed steel tubes. The luggage rack is also chromed for a high-class touring look. The California Vintage is a precious object to be looked after with love and attention. Moto Guzzi has therefore also designed a special bike cover for this motorcycle where luxury is standard. While externally the California Vintage retains the same unmistakable look which brought it success throughout the world, technically it has been profoundly changed over the years and for the 2006 season it has undergone radical treatment. The engine has been almost entirely imported from the Breva 1100, with a considerable improvement in performance. The heads, cylinders, conrods, pistons, sintered valve seats and guides and Nymonic exhaust valves come from the Mandello del Lario naked and inherit its power characteristics. The alternator has also been improved and the flywheel is new. Combustion is more efficient thanks to the twin spark cylinder heads, while the timing system is entrusted to the well-proven mechanical tappets. Other minor technical modifications include the new throttle body guards and cableways between the cylinders and tank. As far as the mechanics are concerned, the braking pressure distributor has been modified to improve efficiency. More powerful, easier to ride and safer, the look of the California Vintage has also been radically changed. An exclusive and well deserved tribute to a motorcycle which has become a symbol. Moto Guzzi has a venerable history of technological firsts. Many of the components now used on the majority of today's motorcycles were introduced for the first time in the historic Guzzi factory on the Lariano mountains. This was the case, for example, with the rear suspension with swingarm - also the origin of a legendary motorcycle raid in which Giuseppe Guzzi, the founder's brother and production engineer, played a leading role. In 1928, long-distance excursions were hampered by a serious technical flaw - the lack of rear suspension. The alternatives used until then were not able to maintain the frame under correct torsional rigidity and what was gained in comfort was lost in lack of handling. The inventiveness of the Guzzi brothers created an elastic frame with a sheet steel box enclosing four springs, together with a swingarm in tubes and sheet metal which they then used on the G.T. It was also the embryo of the first modern rear suspension and the basis for the first genuine Gran Turismo motorcycle. Original in everything, the Guzzi Brothers chose a highly particular test - a 4000 mile journey from Mandello del Lario to Lapland in northern Norway, inside the Arctic Circle. A monumental enterprise, considering the disastrous condition of European roads at that time. But in four weeks, Giuseppe reached his destination. The elastic frame with rear suspension was so successful that it was introduced in production machines and the G.T. was named "Norge" in memory of that unprecedented feat. This is why Moto Guzzi decided to name the first "Gran Turismo" of the new era the "Norge". It is immediately obvious that it has been designed to eat up the kilometres. From the front fairing, for example, which rises up from the profile of the motorcycle as if it were a natural extension. But everything on the Norge 1200 is in the name of total protection. The front fairing is integral and includes leg guards at the front and mudguards at the back to cope with any form of weather without problem. As well as deflecting turbulence away from the rider's chest, the windshield can be adjusted electrically to adapt to the various riding conditions. The powerful front light assembly with its four polyelipsoidal headlights provides a clear view even on poorly lit roads and adds to the charisma of the front of the motorcycle, giving it an aggressive feline look and a design which once again emphasises the combination of form and function. The Tom Tom “Rider” GPS navigation system has been perfectly integrated into the cockpit, offering a Bluetooth wireless connection in addition to satellite navigation; the calls are automatically relayed from the cellphone to the earpiece inside the helmet, allowing the rider to stay in contact with the rest of the world in complete safety. 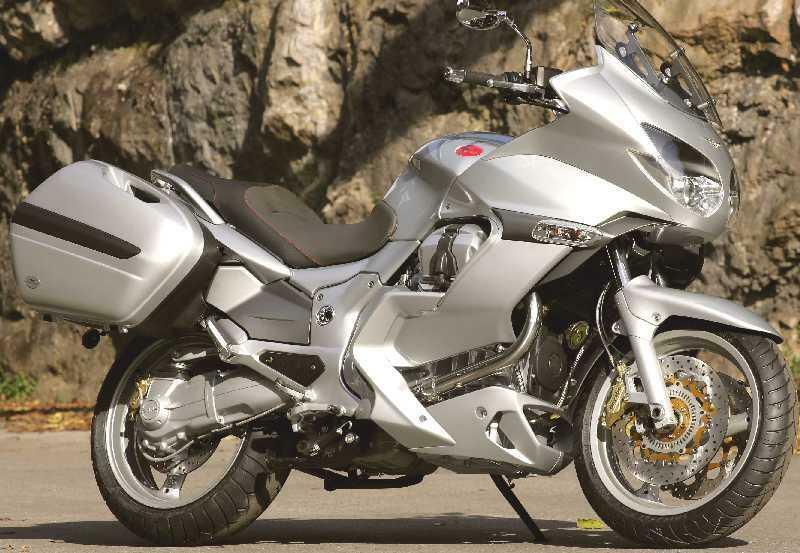 Here’s the first official picture of the Moto Guzzi Norge 1200. The GT-style twin comes with electrically-adjusted screen and ABS and should be available in March 2006. It was shown for the first time at the Milan Show’s press day on Tuesday, November 15.
motorcyclenews.com is at the show and will bring you more details as we get them. Guzzi is also showing the Griso at Milan, now that it's ready to for an 06 0n-sale date. It was first shown at the Munich Bike Show in 2004. Also present is the new Moto Guzzi California Vintage, a fully-dressed cruiser, powered by a 1064cc engine, with a five-speed gearbox. And read more about it in MCN, out on November 16. See page two for full details from Guzzi's own press release about these two new bikes.